You had a flop (paathshala) and you had a hit (anando brahma). What did flop and hit change for you and your career? Not much except I didn’t had to wait for another two years to make my next film. Hit or flop you got start all over again its like in cricket it doesn’t matter even if you have ton, you got to start fresh and from zero…. Biopic is a genre that’s rarely attempted. Why did you pick it? Bio epic or any story inspired by real character or true event are just like any other story, it has to excite me as character and story. For me a story evolves and when its ripe and real I go on to tell it.. I don’t overthink about genre, trend or market. Why do I pick ? I strongly feel the story chooses me to be its voice. i am just the messenger. I truly mean it knowing myself and my abilities. Why did you pick Padayatra as your subject? Are you not afraid of polarisation as audiences have their own political inclinations? Padayatra as an event stood out in the life of YSR. An event based bio epic is quite new to india. We are used to telling the whole life unlike in the west where the darkest hour, kings speech, Lincoln etc. even though its event based the story would go beyond that timelines and events in YSR’s life. Directing Mammooty is a golden opportunity to relatively new directors. What were your apprehensions before directing him? Call it collaborating than directing. How do you direct someone like Mammootty garu. Its truly an honour witnessing him perform. I have learnt how to collaborate with artists seeing him how he approaches his role. I was not nervous as I keep it simple I don’t believe in director knowing all and calling the shots. When you are honest and open about your abilities and weaknesses its easy to work with artists like Mammootty or with a technician like sreekar Prasad. Film industry is riddled with ego. You are very casual with sharing credit for the work on Yatra? I don’t over estimate myself or I am insecure. I am story teller and film making is such beautiful art where so many artists/techinicians come together to create one piece of art. How can director call his own. Its starts from the writer and it passes through a long journey. Its my job as a director to create a vision and make every artist and technician part of it. Its beautiful or more artistic when they create together than take directions. From commercial point of view, what do you think will work for Yatra? Not sure what is commercial point of view. A good and engaging story is the only commercial point. Look at secret superstar what do you call it… a good story has no boundaries. Yatra has its own universal emotions and elements to work. 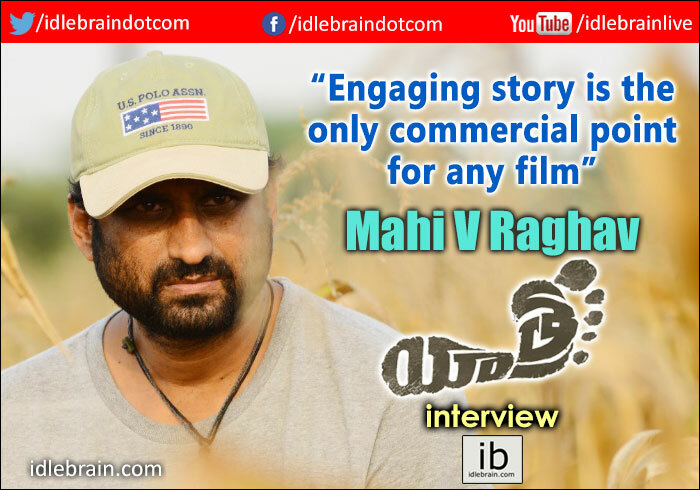 When I wrote it my objective was to make the story work even if the audience didn’t know YSR. I have invested on the story than be carried away by the real YSR persona. Tell us about your producers? Its produced by 70 mm entertainments who did Anando Bramha. I didn’t explore any options after anando bramha for two reasons one because they gave me an opportunity when no one did and two vijay and Shashi are passionate and someone who loves to be part of the film making. Why break it when it works. The only addition this is time is shiva meka who had earlier co produced kudirithey kappu coffee. I wanted him to be part of this as it was my mistake and I feel I let him and myself down with my values and work ethic. I really hope it works for him this time. Tell us about own banner three autumn leaves? Three autumn leaves is new company, I founded along with shiva meka and rakesh mahankali are partners. Three autumn leaves will make its debut with yatra. I have learnt film making being a producer and I understand it much than when I started off moonwater pictures. Even as a director I have always been responsible in terms of production, marketing etc.. as a director I have never been remenuarated I always have taken a stake or share of profits after the producer has taken his investment. I hope to collaborate with other production houses to make independent films. My strength lies in writing, would like to write more and see if I can find someone to direct my stories. Final word: tensed, nervous ? how much is riding on yatra success? Success or failure, the sun still raises.. Will get on with life and writing my next story. On a lighter vein if it succeeds I will buy a new iphone if it fails I will get protection case of the existing phone so it can last for another year.